Greetings. Recently, I discovered that dairy (think sour cream, cheese, heavy whipping cream, etc.) is causing my body a tremendous amount of grief. As a person doing a ketogenic diet, you might think the death knells would be ringing for my keto-ing days. Au contraire, mon amis! Instead I am doing everything in my power to make sure I can continue producing the ketones that are making me the best version of myself, all while finding ways to sub out the dairy-laden products for much less inflammatory foodstuffs. One thing that was a staple in my diet was my homemade keto-friendly ranch dressing, replete with all kinds of sour cream, and heavy whipping cream. It was the bomb. All smooth, and creamy, and savory, and salty, and full of dairy goodness. It was a part of my everyday menu, at least six days a week. I do miss it. HOWEVER, I was lucky enough to find a very capable and laudable substitute that contains none of the aggravating dairy components. 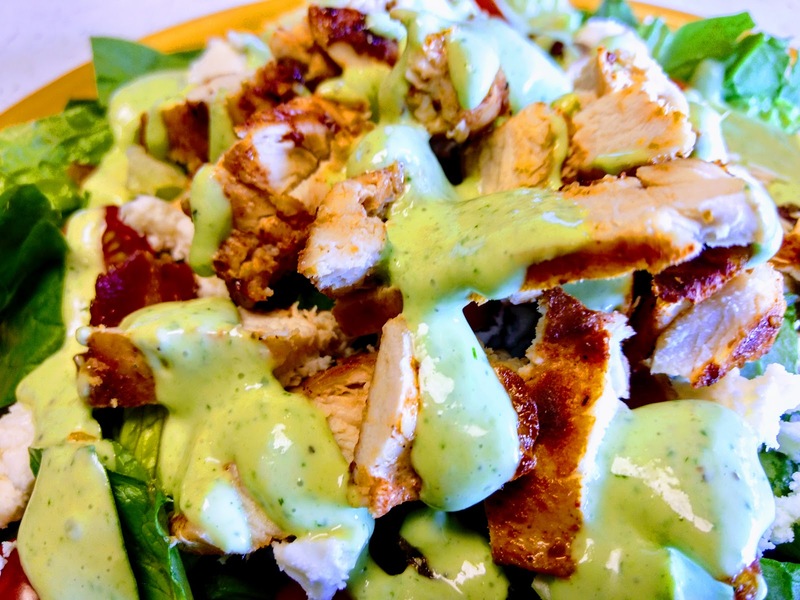 From KetoDiet Blog, it's called "Fat-Burning Salad Dressing ..."
The first time I made the Fat-Burning Salad Dressing, I followed the recipe precisely, which included Dijon mustard and lemon juice. I have to admit, it wasn't my favorite, but it was salty, and savory enough that I powered my way through the batch, because I wasn't going to throw out that much good oil, and herbs! She does list several variations, and though I did not use any of those ideas, I DID make a few of my own tweaks to come up with a very solid replacement for my previous salad accessory. I bumped up the amount of mayo, and oil to 1/3 cup each, ignoring the MCT oil measurement, because I am out. I completely omitted the mustard, and cut the amount of lemon juice down to just a very small splash. My herbs included one green onion (scallion, spring onion, whatever you want to call it), a small bit of fresh dill, and probably three to four tablespoons of Italian parsley. I used chopped garlic, to the tune of about 1 teaspoon, because I absolutely hate trying to clean my garlic press without that little tool that pushes the garlic out of the holes. Then, I added a teaspoon each of salt and coarse-ground black pepper, onion powder, and garlic powder. You could probably take the time to hand chop all the herbs and stir everything together with good result, but again, me=lazy, so I put my trusty Magic Bullet blender to work. You get dressing in 30 seconds or less, no chopping involved. Well, that's a lie. I cut the green onion into a few smaller pieces, just to speed up the process. The way I made it, I ended up with probably a full cup (8 ounces) or more of dressing, which will last me an entire week, typically. Not sure why, but I think my version looks a whole lot better than the picture in KetoDiet Blog's recipe post. Maybe because I added less lemon juice and blended the bejesus out of it. Regardless, the flavor is perfect, and so absolutely versatile that I can make whatever dressing I want, with very few carbs, ZERO sugar, and full flavor. All in all, I'd say this recipe is a must-try, even if you're not keto-ing, but you just want something that hasn't been processed or corn-syrup-ed to death. I promise you that making your own dressing is not expensive, it is not difficult, it is not time-consuming, and the more you make and consume your own creations, the more you will notice how not-good, and even disgusting mass-produced salad dressings can be. 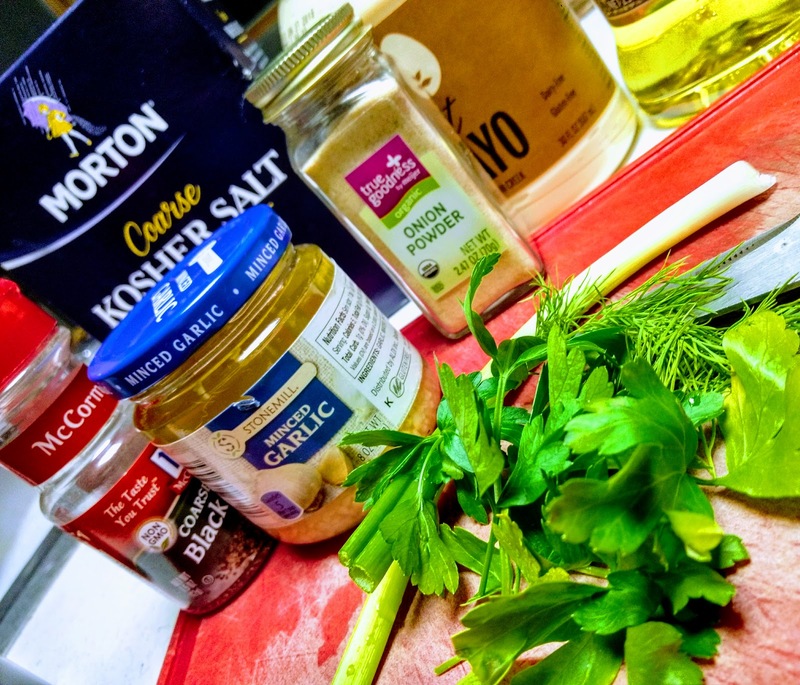 So, check out KetoDiet Blog's Fat-Burning Dressing, here, give it a whirl, if you're in the market for a new dressing, and let me know what you think.